Irish immigrants and their offspring were the largest group to populate Australia between 1788 and 1945, after settlers of English birth and descent. The Irish comprised nearly 25 per cent of all non-Indigenous Australians by the time of Federation in 1901. A New History of the Irish in Australia, as its title suggests, offers a new look at this major group of founding peoples. The book uses source materials not employed previously; it examines topics not studied in the past; it takes approaches not attempted before; and it draws upon the latest research published, not only in Australia, but overseas as well. The book does not aspire to be a general account, like the one Patrick O’Farrell published over 30 years ago. Instead, this new history is concerned with certain key themes and topics, some dealt with previously, but many not—or at least not dealt with in Australia before. Issues around race, gender, colonialism, popular culture, immigration restriction, eugenics, crime, mental health, employment discrimination, politics, war and religion are all interrogated. While taking a traditional national approach in focusing on the Irish in one country, the book also has a trans-national dimension in that it situates the Australian Irish experience in the much broader context of the worldwide Irish diaspora. 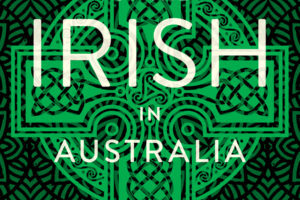 By adopting this approach, the book reveals much about what Irish Australians shared with Irish communities elsewhere, but, in addition, it throws light on the ways in which the Irish-Australian experience was unique. In doing so, this book makes a significant contribution to the history of Australia, of Ireland and of the Irish diaspora. A necessary corrective to the false unity of the term ‘Anglo-Celtic’, this beautifully controlled and clear-sighted intervention is timely and welcome. It gives us not just a history of the Irish in Australia, but a skilful account of how identity is formed relationally, often through sectarian, class, ethnic and racial divisions. A masterful book.